Microsoft has taken aim at Google before with its 'Scroogled' advertising campaign, and now it's revived the attack tactics, slating Gmail's policy of reading your emails to target ads. "Think Google respects your privacy? Think again," says Microsoft's advert. It says that nasty Google goes through your every email, reading every word, so it can target ads to you based on what you're writing about. 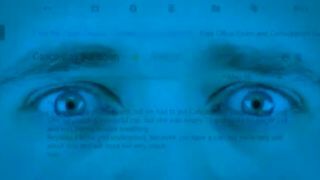 To illustrate this, Microsoft has a pair of shifty-looking eyes reading an email. Outlook.com, however, "prioritises privacy", according to the ad. The WSJ has reported that Microsoft reads the subject line of every email and target adverts based on them. That said, when asked, a Microsoft spokesperson vehemently denied this staing, "Microsoft does not scan the subject lines of email for ad targeting. And we're working to correct that with the WSJ." Add to that, TechRadar conducted tests that seem to support Microsoft's claim. It's not the only company to attack others in its advertising either. Samsung has previously slammed Apple and its loyal fans, which may have something to do with the billion dollar court case that the two fought out last summer. BlackBerry (nee RIM) also took on Apple with its own 'Wake Up' campaign. Take a look at Microsoft's latest ads below, and let us know what you make of them.